For more information on becoming an exhibitor or sponsor at Agile Development & Better Software Conference East, please contact our sales team at 904.278.0524 or 888.268.8770 ext. 260 or email [email protected]. 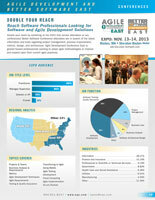 The Expo, November 13–14, 2013 gives vendors access to both Agile Development & Better Software Conference East delegates. Companies with software development products and services will certainly benefit from direct sales interaction with this highly targeted and motivated audience—the majority of whom spend at least 60% of their work effort managing or implementing software. A limited number of sponsorships are available to vendors. To find out how you can become a sponsor, contact our sales team at 904.278.0524 or 888.268.8770 ext. 260 or email [email protected]. To learn more about all the marketing opportunities we offer, request our full media kit here. Copyright © 2012-2013 Software Quality Engineering, All rights reserved.